Nestled in the Sierra Madre Occidental, the Riviera Nayarit is synonymous with abundance. Nestled in the Sierra Madre Occidental, the Riviera Nayarit is synonymous with abundance. Frequent summer rains result in fertile land, which produces a wide variety of tropical fruits. Coconut, banana, tamarind and petacon mango trees are found everywhere, and their fruits are eaten in cocktails, natural juices and sweets. The shores of this paradise, washed by the waters of the Pacific Ocean, are home to a large marine wealth. Here, fishermen fish daily for dogfish, sea bass, snapper, marlin, shrimp and oysters, among other marine animals. If you want to learn about the taste of the bottom of the sea, go to a palapa or restaurant whose specialty is seafood. You will find them everywhere! The star of Nayarit cuisine is undoubtedly the pescado zarandeado (tossed fish). This Nahuatl delicacy coming from the Mexcaltitan island is mainly prepared with snapper, sea bass or golden cod, all of them, when exposed to heat release a delicious juice. They are marinated with lemon sauce, soy sauce and chile and are smoked over mangrove wood. They are decorated with slices of onion, tomato and cucumber, and are served with fresh tortillas. If you prefer a cooler dish to shield yourself from the heat, be sure to order the aguachile. This dish consists of fine slices of raw shrimp marinated in lemon juice, and also contains slices of red onion and serrano chile. It is eaten together with corn tostadas. Do you want to try something unique? Order oyster enchiladas. To prepare them, the oysters are fried in olive oil with epazote, garlic and salt. Then, tomato sauce, serrano chile and cilantro are added, and they are served with fresh cheese. A delicacy you will not find anywhere else. Order the soup of the seven seas, with shrimp, octopus, sea snail, fish, crab and mussels… a true gourmet delight. Another option is Nuevo Vallarta oysters, with cream tomato, onion and serrano chile, with grilled cheese and served with rice. To drink, choose a glass of raicilla, a drink similar to the Tequila, prepared in Jalisco. Bon appétit”! 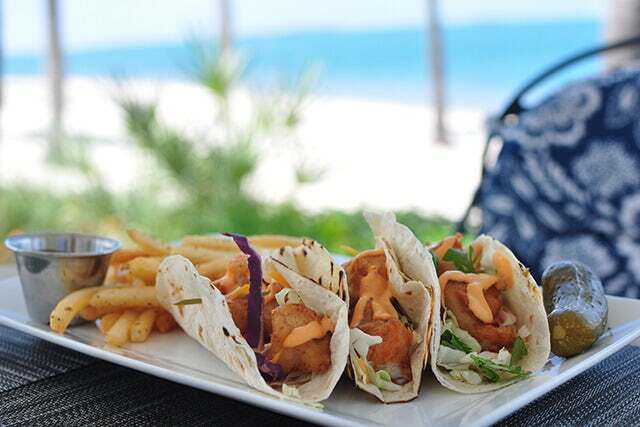 Any time is a good time to eat a pair of seafood tacos “Baja” style. This place’s favorite? A shrimp taco with “Saylulita” sauce, containing pineapple and garlic. Be sure to try the fish burritos. At night, this place has a lively bar where tropical cocktails are prepared.